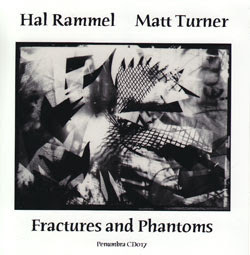 In the interests of promoting the space between modern classical and avant improvisation, I feature today an album that has a go at that, Fractures and Phantoms (Penumbra CD 17) by Hal Rammel and Matt Turner. What we have is a fascinating series of vignettes that concentrate on spontaneously produced sound-noise sculptures. Matt is on cello and Hal on something they call "amplified palette." It sounds like prepared cello and prepared "everything." There are sound moments where you might be hard pressed in a blindfold test to identify the instruments involved, a more sonant kind of Cartridge Music, minus the cartridges. Matt absorbed the streams at New England Conservatory. Both artists bring their own keen sense of sound possibilities to the table. It's sometimes like a set of wind chimes, sometimes a bit more percussive, but always intriguing and not without a certain amount of ambient attractiveness. You wont find anything to hum along with. Instead you will be transported to a sound world worth a lengthy visit. Listen and get someplace. Andreas Staier, "... pour passer la mélancolie"